Description & History of Borate Mining in Tick Canyon. By Thomas E. Gay Jr. and Samuel R. Hoffman | Assistant mining geologists, California Division of Mines. Manuscript submitted for publication October 6, 1953. Occurrences of boron minerals have been noted in Los Angeles County in Oligocene (?) rocks of the Vasquez series. Only one deposit, the Lang, proved extensive enough to be mined. Lang (Sterling) Mine. Location: secs. 27, 28, 29, 31, and 32, T. 5 N., R. 14 W., S.B.M., in Tick Canyon, about 1¼ airline miles east of the Mint Canyon highway, about 3½ airline miles north of Lang. Ownership: Pacific Coast Borax Company Division of Borax Consolidated, Ltd., 630 Shatto Place, Los Angeles, California owns many patented claims covering an area about 1¾ miles in length and about 2,000 feet in width. The Lang mine, the only source of borates in Los Angeles County, was active from 1908 to 1922 when its mineable calcium borate bodies were exhausted. The borate minerals occur in shale beds in the nonmarine Vasquez series of Oligocene (?) age. The Vasquez series is composed principally of arkose (in part tuffaceous), basalt, and conglomerate with subordinate limestone and shale members. The Vasquez series in the vicinity of the mine has been deformed into northeast-trending folds modified by many cross-faults and longitudinal faults. The interlayering of competent volcanic rocks with incompetent sedimentary sequences has contributed to the structural complexity of the area. The dominantly sedimentary nonmarine Miocene Tick Canyon and Mint Canyon formations unconformably overlap the distorted Vasquez beds north and south of the mine area. Borate minerals present include colemanite (Ca2B6O11•5H2O), the principal ore mineral, in by far the greatest abundance; howlite (H5Ca2B5SiO14), which occurs in cauliflower-like masses much prized by mineral collectors; probertite (NaCaB5O9•5H2O); and ulexite (NaCaB5O9•8H2O). A colemanite-bearing bed as much as 30 feet thick and about 1,000 feet long is enclosed in and intermixed with shale. This bed strikes a little north of east and dips about 70° S. on the north flank of a syncline plunging gently southwest. Thinner colemanite layers and several thin howlite-bearing strata area also present but were not mined. Borate-bearing layers of sub-commercial grade have been prospected in many places over the area of company holdings, which extend for nearly 2 miles along the northeast strike of the principal colemanite-bearing bed. The origin of the deposits is discussed by Gale (1914, pp. 4-5) who quotes Eakle (1911) saying "It seems probable that the original site of the deposit was a marsh containing marl and calc tufa with mud and considerable organic growth, and that later waters charged with boracic acid flowed into the basin and converted the carbonate of lime into the borate… The origin of the boric acid is presumably volcanic." The strongly monomineralic character of the deposit and lack of mixed alkali slats indicate that it was not formed by evaporation of desert lake waters. The colemanite was mined through two vertical shafts, each 350 feet deep, from workings on the 100- 200- and 300-foot levels and from numerous auxiliary openings. The deposit was mined along a strike distance of 800 to 1,000 feet, one segment about 600 feet long being mined on all three levels. Mining methods included the use of square-set stopes in some places and shrinkage stopes in others. The shrinkage stopes were about 70 feet long, 60 feet high, and 20 feet wide above the ore chutes. The square-set stopes were about 40 to 60 feet wide, 70 feet long, and 60 feet high. Pumping was required to keep the lower levels free of water. Although many details of the history of operation of the deposit have been lost in the passing of time, the following general account has been reconstructed from unpublished records and from conversation with men acquainted with the deposit. In November 1907 colemanite was discovered on the property, but production did not commence until 1908. The deposit was acquired by the Sterling Borax Company, a consolidation of borax interests including Stauffer Chemical Company’s Frazier Borate Mining Company, American Borax Company (boric acid works at Daggett), Brighton Chemical company (refinery in Pennsylvania), and Thomas Thorkildsen and Company (refinery in Chicago). During the earliest operations of the mine the colemanite was sacked for shipment, but four oil-burning calcining furnaces were later installed. Two were wedge furnaces with a capacity of about 40 tons each per 24 hours; the other two were horizontal furnaces 50 feet long with a capacity of 60 tons each. After the water of crystallization was driven out by roasting, the bulk of the admixed shale impurity was removed by means of an air current passing through a cone screen. A refined ore containing 48 to 50 percent boric oxide (B2O3) was produced in this way and shipped via a standard-gauge railroad built especially from the mine to Lang Siding of the Southern Pacific Railroad. The bulk of the refined ore was shipped to the several eastern refineries of the company for conversion to commercial borax. About 80 men were employed at the mine. The maximum daily production was about 400 tons, and an output of nearly $500,000 worth of calcium borate was credited to the mine for the year 1914 (Tucker, 1927b, pp. 318-319). During World War I mine production was limited by a shortage of railroad cars available for shipping the ore. Unpublished records of the California Division of Mines indicate that total production during the 16-year life of the mine was about 100,000 tons of ore valued at about 3 million dollars. The mine yielded a substantial share of the colemanite mined in the United States from 1908 to 1920. During the latter portion of the period 1911-18, during which the deposit was nearly mined out, the Pacific Coast Borax Company entered into a sales agreement with the Sterling Borax Company, but did not own or operate the property. Faced with an ever-declining price for borax and, as the mine grew deeper, with rising mining costs, the property was sold to Pacific Coast Borax Company in 1921. The new owners conducted a scavenging operation in which nearly all remaining colemanite was removed. The depletion of known reserves of colemanite led to the final closing of the Lang mine in 1922, and dismantling of the plant in 1926. 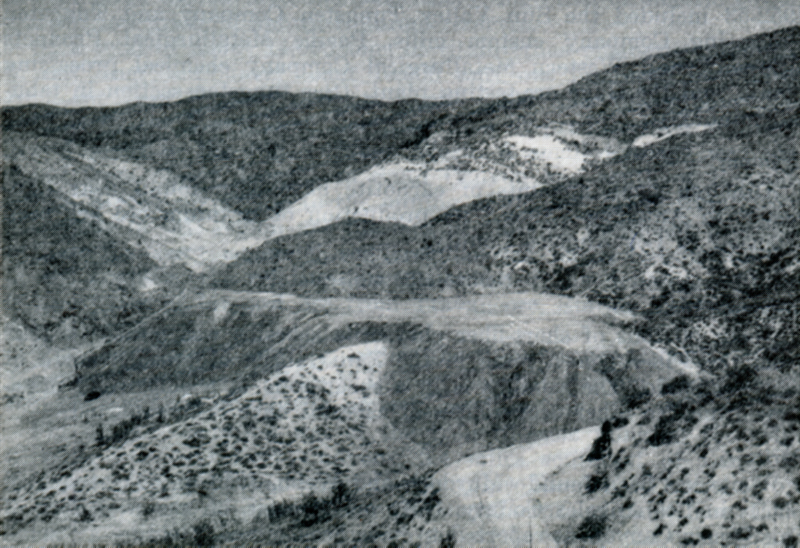 The development of a rich deposit of the sodium borate, kernite, at Boron in 1926 marked the end of the extensive mining of colemanite in the state. The Lang mine workings are now caved to an unknown extent and are flooded below the 150-foot level. The thin seams of colemanite remaining at the property are now sub-commercial and the siliceous borate, howlite, is not marketable. 1. Geologic description largely summarized from data supplied by R.H. Jahns and others, Dept. of Geological Sciences, California Inst. Of Technology, 1952. 2. Gower, Harrison, chief geologist for Pacific Coast Borax Company, Personal communication, 1952; Ross, Norman, master mechanic of Boron plant, Pacific Coast Borax Company, Personal communication, 1952; and Ver Planck, W.E., Jr., assistant mining geologist, California Division of Mines, Personal communication, 1954. Eakle, A.S., 1911, Noecolemanite, a variety of colemanite, and howlite from Lang, Los Angeles County, California: California Univ., Dept. Geol. Bull., vol. 6, no. 9, pp. 179-189. Gale, H.S., 1914, The origin of colemanite deposits: U.S. Geol. Survey Prof. Paper 85, pp. 3-9. Tucker, W.B., 1927b , Los Angeles field division, Los Angeles County: California Min. Bur. Rept. 23, pp. 287-345.